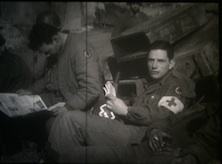 This DVD about the 44th Infantry Division takes place in World War II Europe during the Fall of 1944 and Spring of 1945. 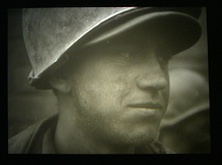 On November 17th, 1944 the 44th Infantry Division was fighting in the XV Corps of the U.S. Seventh Army. The 44th Division was operating in the Vosges Mountains and was responsible for the left wing of the 7th U.S. Army. This DVD from our The Bulge and Beyond Series begins here and continues through to late-February 1945 as elements of the 44th Inf. Div. 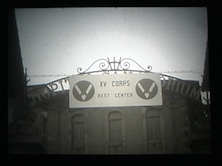 arrive at the XV Corps Rest Center in Nancy, France. 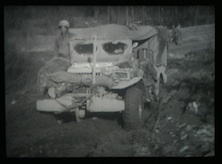 The contents of this video show the action as it was originally recorded by the 163rd Signal Photo Company during these historic operations. 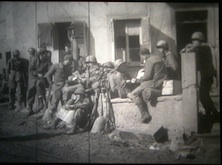 The footage in this video is intended to be strictly that of the 44th Infantry, and only shows other unit footage when two or more units are intertwined. Combat Reels has researched and compiled all of this raw combat film footage, then reformatted it into the DVD format for your viewing pleasure. 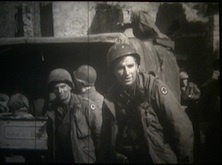 Great for veterans, families, military historians and military enthusiasts, this DVD has many different scenes of 44th Infantry Division soldiers and attached units. 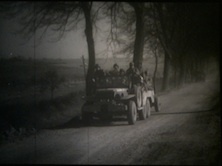 The first images found for the 44th are from Embermènil, France, as men are moving into positions. 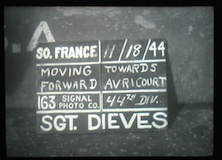 Then the 44th Division moves through the town of Avricourt and then onto Saarebourg. 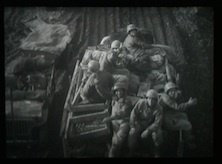 Troops are seen marching in the town of Saareguemines and engineers are seen working on a damaged bridge. 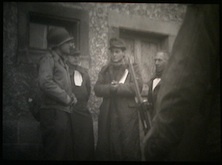 German SS troops are searched by men of the 44th in the town of Wittring, France and German deserters, disguised in civilian clothing, are questioned as well. Troops of the 44th move in and around Achen, France as the defensive lines are firmed up. Enjoy these close up shots of the actual locations the 44th Infantry fought for and occupied. Order your copy today and enjoy these and many more up close shots of equipment, vehicles, weapons, uniforms, helmet markings, and of the faces of the men of the 44th Infantry Division themselves on these candid movie film reels of history, presented to you on popular DVD formatted video!